Well that's the best I could do. And I guess everyone else was severely challenged this week, too, or on holidays like me. Everyone except moooooog and Quirkyloon. So let's see what our co-winners came up with shall we? Brainwashing 101: so easy a dog can do it. Way to go guys. You be hangin' with dufus. Wanna join me on the beach at Ogunquit, Maine? Yeah, we could "wave" at each other. I guess my C3PO had a problem, my comment didn't make it thru Thursday!? Heh ! I have a Star Wars themed post too today on my blog! The basement of the death star is in dire need of an upgrade compared to the rest of the facility ! I bet it's much cooler in Maine than here in AZ. So yes! I'll join you in Maine! Tell me where I should pick up my ticket? Hmm. That's funny. We seem to have a bad connection. HA! Thanks for letting me Hang With Ye! It's always a lot of pun! HA! 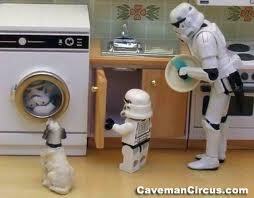 Those storm troopers really work hard at keeping their uniforms clean. Oh, too late Quirks. We're on our way home in the morning. Temperature at the beach was in the mid 80s today. We really had great weather all week and a fabulous time.